What makes it super green? We’re about to find out. Shall we? The base is frozen banana, cucumber (we learned about cucumber’s health benefits in my Cucumber Smoothie), and coconut milk. I include hemp seed as an optional addition for healthy fats and protein. And last but not least, spirulina! 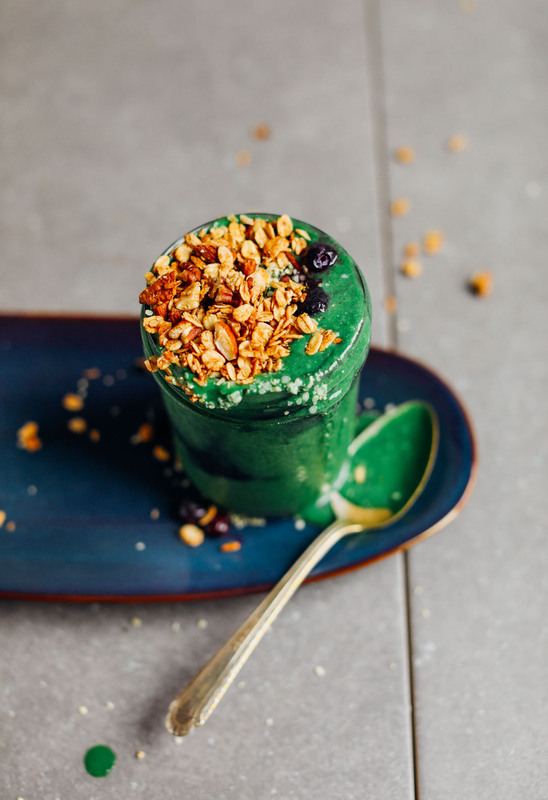 I asked you guys on Twitter if you’d be interested in seeing any recipes with spirulina, and you said yes! I’ve included tips on where to buy and how to use it in the notes. Spirulina is an extremely nutritious blue-green algae that’s high in B vitamins and minerals like iodine, beta-carotene, antioxidants, iron, and manganese. It’s also 60% protein and a complete protein, containing all essential amino acids – 1 Tablespoon boasts 4 g protein. So what’s the big deal? Spirulina is a very concentrated source of vitamins and minerals and also very detoxifying and alkalizing to the body, which is why it’s considered a “super food” in many circles. I’ve been incorporating it mainly into my smoothies and love its intense color, neutral flavor, and health benefits. It’s a great way to get a green smoothie without adding handfuls of kale. What does it taste like? Eaten directly, it has a somewhat unpleasant taste – kind of like seaweed. But, when thrown into smoothies or desserts, it’s undetectable. Huzzah! 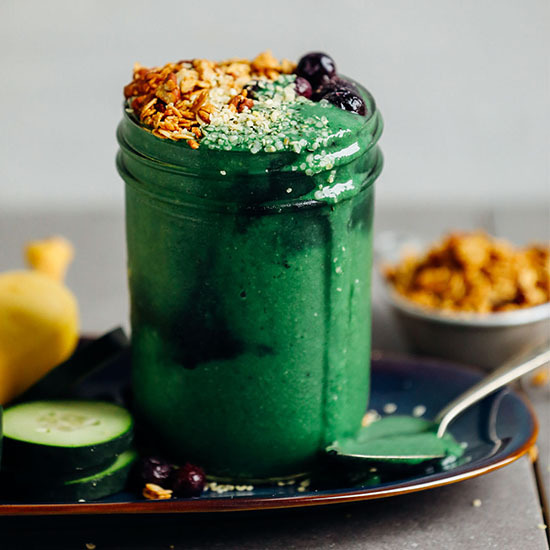 This smoothie makes the perfect plant-based breakfast or snack. For even more protein, add more hemp seeds, chia seeds, or your favorite vegan protein powder. And don’t forget your toppings! I went for blueberries, hemp seeds, and granola (which was inspired by my girl @shutthekaleup!). For more smoothies spirulina would pair well with, check out our Hide Your Kale Smoothie, 5-Ingredient Detox Smoothie, Ginger Colada Green Smoothie, and Creamy Cucumber Pineapple Smoothie! A nutritious and vibrant green smoothie with 5 ingredients: banana, cucumber, coconut milk, spirulina, and spinach! The perfect plant-based breakfast or snack. 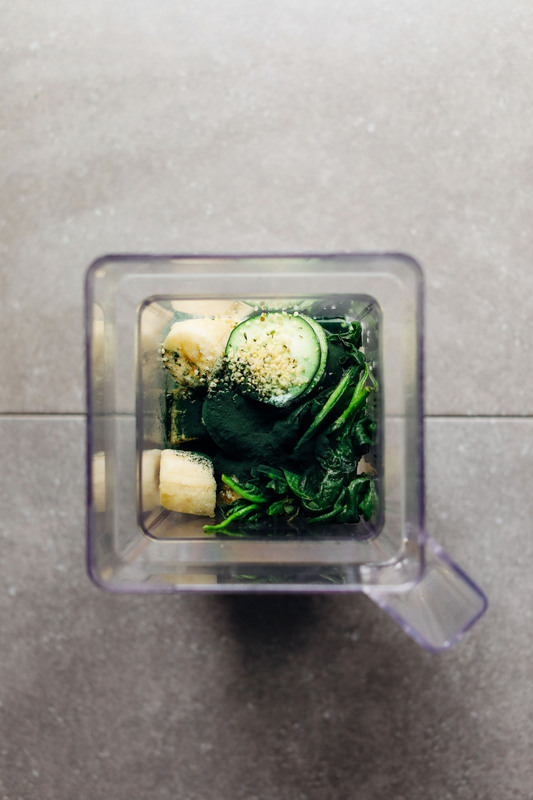 To a blender*, add frozen banana, cucumber, coconut milk, spinach, spirulina, and hemp seed (optional). Blend until creamy and smooth, scraping down sides (or using smoothie wand) as needed. If too thick, thin with water or more coconut milk. If too thin, thicken with ice or more frozen banana. Taste and adjust flavor as needed, adding more banana for sweetness, cucumber for freshness, or greens or spirulina for green color. See note about spirulina (brands + how much to add). Serve immediately as is or in my preferred: top with blueberries, granola, and more hemp seeds. Best when fresh, though leftovers will keep covered in the refrigerator up to 2 days or the freezer for 1 week. Thaw to enjoy from freezer. *I use the Now Organic Spirulina powder, which was $13 at Whole Foods, but it can also be found online. I've also heard good things about this brand and this brand. *When adding spirulina to smoothies, start with 1 tsp and add more as desired, but this is the max for me without tasting it. Otherwise, it can start tasting a little seaweedy. *Granola recipes: Peanut Butter Chocolate Chip Granola, Banana Bread Granola, Simple Quinoa Granola, or Nut 'n' Honey Granola (the one I used in photos). *Find my blender review here: Vitamix vs Blendtec. *Spirulina also works extremely well when added in the same quantity to my Ginger Colada Green Smoothie! *Nutrition information is a rough estimate calculated without toppings or hemp seeds. THIS. I’ve been trying different green smoothies without finding one that I really wanted to repeat. Until this one! Funny enough, I was about to take my morning spirulina ‘pills’ when I came across this smoothie recipe and was excited to realize I had all the needed ingredients. I was concerned about the sweetness when putting the ingredients in the blender, but the taste had a nice balance in the end. I live in the tropics where bananas have amazing flavor and I think that helped. I find bananas in the U.S. bland so I’d probably play with adding something more to give sweetness if making this back there. Finally, reading others’ comments on here about spirulina making them sick… now I understand why the packaging mine comes in indicates to start with only a small amount the first few days and then slowly increase the quantity. It’s powerful stuff and the body needs to adjust. Great stuff though! Mine come in a compressed pill form so I just crushed them up before putting them in the blender for this recipe. You’ve made me excited about green smoothies and my spirulina! THANK YOU for sharing this recipe! Has anyone made this without bananas? I can’t stand the taste of them. I was thinking Greek yogurt? I made this smoothie today and even though the color didn’t turn out as vibrant as in the picture it still tasted amazing! I’m planning of making this at least twice a week. I will try to make it with almond milk instead of coconut milk this time to make it lighter. These are some good recipes to make Organic Spirulina fun to consume for kids and adults. The benefits of this superfood are amazing and this way of presenting it makes people crave for it. I have been using Organic Spirulina by Prolgae on a daily basis and it has really worked out for me. 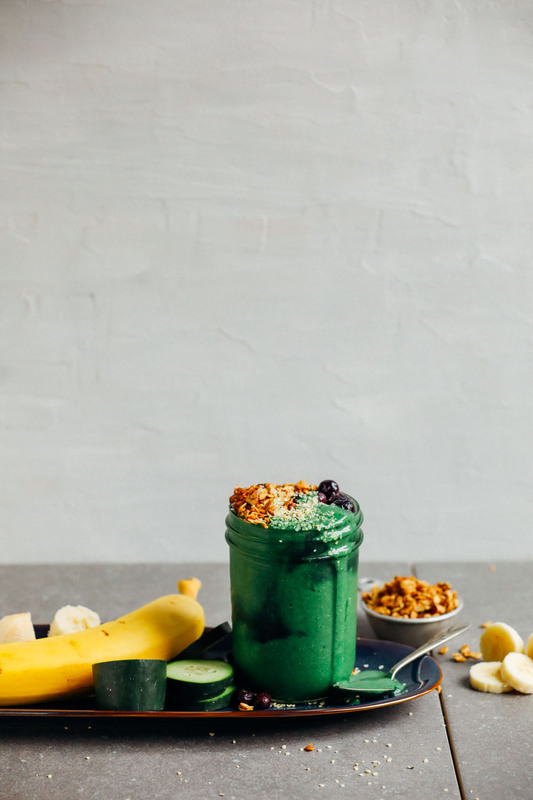 I use the Spirulina Powder rather than the capsules, but this smoothie recipe will make my day anytime. Is this recipe effective at masking the “fish tank” taste? If not, do you have recipes that does the trick? Hi Celia! 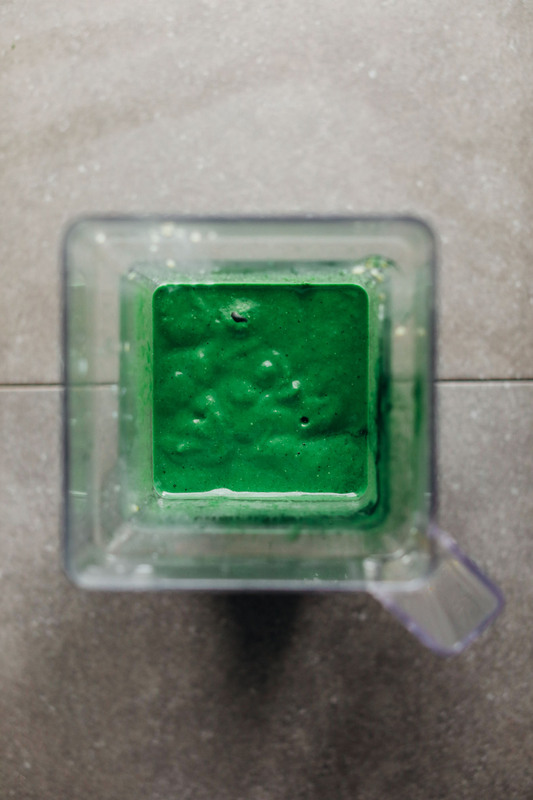 This recipe masks the flavor of spirulina well, as it only calls for a small amount. If you are still worried about it though, I’d recommend adding half the amount to start! Absolutely delicious. Just recently started getting into spirulina. The cucumber really makes it taste refreshing while it has a rick creaminess from the coconut milk. I didn’t think there would be enough liquid to blend, but the cucumber really makes it work. love it! We are glad you enjoyed it, Melayna! My husband had polio when he was about 18 months old. He has been dealing with Post Polio Syndrome for many years. We consider Spiralina to be a miracle in his life. In 2002 we consulted with the premier Post Polio Clinic in the USA. After running tests and a full checkup they told us that if he was very lucky that he might go another 5 years before he would be in a wheelchair. Not what we wanted to hear. We would go back every 6 months for a follow up so we could tell how he was doing. My mother-in-law had given my husband a book on alternative medicine and he found a page that recommended Spiralina for nerve damage. Polio does not destroy the muscles it destroys the nerves that send the necessary messages from the brain to the muscles. So he started taking it with amazing results. The last time we had a check up at the Post Polio Clinic we asked them to run a muscle strength test. They agreed to do that and before long they had the whole clinic watching as he walked up and down the testing hallway. Something different was happening and everyone knew it. The doctor was stunned! She kept looking at his chart and then asked him to walk down the hall again. Finally she asked what he had been doing? BECAUSE He had gained 4 levels of muscle strength! It was unheard of for a Post Polio patient to gain muscle strength! The Spiralina had helped restore the nerves in his legs enough that he had regained the muscle strength! Spiralina has bought him many years of walking on his own two feet! The one thing we would recommend for storing the Spiralina is to keep it in the refrigerator or it will smell awful! As farmers we know about sillage… a way of storing corn fodder so that it can be used as feed for cattle. It will ferment and take on an unpleasant odor. Other than that it is wonderful! And it is very inexpensive! This is the first thing I’ve tried with Spirulina and it is SO GOOD! Excellent recipe! I just tried this and I liked it so much I had both servings at one pop! Here are a couple of tips that worked for me: 1) I was washing/chopping kale for something else and had extra, so I saved out 1 c. and put it in a container in the freezer with the banana. 2) I pre-tested my spirulina tolerance a while back by adding 1 tsp to about 1/4 c. orange juice + 2 cups cold water and drinking that. The orange juice masks most of the spirulina taste and it’s a quick and easy way to see if you’re going to have issues with the spirulina. Thanks for a great smoothie recipe! I’m looking forward to trying others, esp the Ginger Colada Green one. This is a delicious smoothie that I drank almost every day for a while. Somehow I can’t stomach cucumber in smoothies so well, though. Makes me feel strangely nauseous. Does anybody else experience this and knows a remedy? Could I add Cinnamon, Turmeric and Cayenne to this for extra benefits? I am on a smoothie kick from your website. Thank you for all these yummy recipes! This was very mild and I was pleasantly surprised. ***I used fresh Cashew Mylk I just made. If you love the benefits of spirulina you should also try moringa (organic is a must). It is even more powerful!??? Similar to spirulina, but milder.Still, better to mix it with smoothie or a little organic juice.In smoothie you can’t even taste it. ? I absolutely love this! Thank you for the recipe. I love spiraling and this recipe looks delicious!!! Love this smoothie! I’ve just started using spirulina and this recipe was the best one I’ve tried so far. The combination of coconut and cucumber is delicious. I added a few celery stalks, but otherwise kept to the recipe. Thanks! Spirulina is an amazing superfood, but it has a taste that is hard to deal with. I am sure that this recipie of yours will deal with the taste aspect. I have written an article entitled ’29 reasons to take spirulina every day.’ I will really appreciate if you take a look on my article and give a link. Hi! This looks great. I have developed an allergy to raw spinach and kale. Do you have any suggestions for what to substitute in its place? I used to love getting all my greens in my smoothies! Hi Emma! You can replace it with any other greens! Chard perhaps? 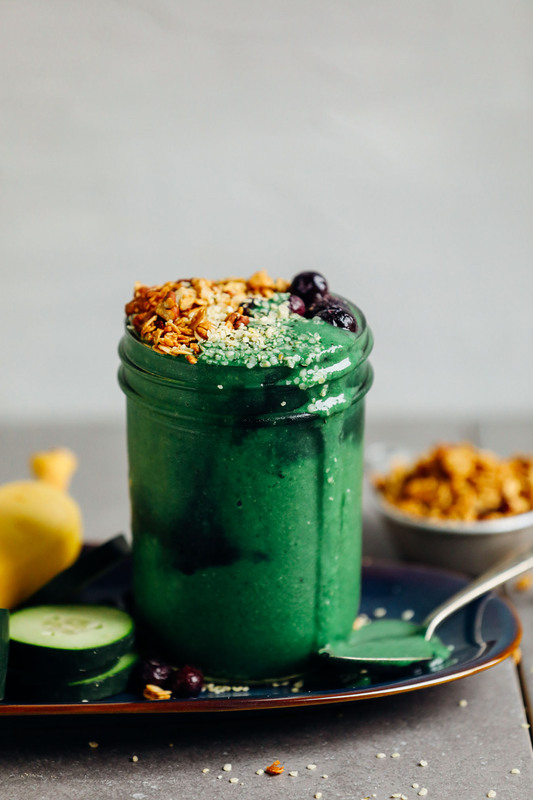 Never tried Spirulina before but this green smoothie seems really healthy and well suited as summer approaches ! As I work in an events company in London where the food/cooking events category is quite popular, I am becoming more aware about eating homecooked meals with healthy products. I will definitely make this smoothie to sip on my way to work! The best thing about spirulina is it colour! This is gorgeous. I haven’t tried using cucumber in smoothies much but I love using zucchini! Chlorella is great too to switch up the spirulina. This looks sooo refreshing. Thanks! I will try one of your recipes this week. I am a big green smoothie fan, but unfortunately did not love this recipe! The flavour was just a bit lacking, and wasn’t creamy/sweet enough. Love your recipes Dana, I have made loads of them!!!! I was also able to find it in the bulk section of my local natural food store. Purchased 2 TBSP for under $2! Beautiful recipe! Will have to try this once I get some spirulina. Hope all is well in your life! I love spirulina. It’s more expensive than fits my $100/week Nyc budget, but lately I’ve been finding it at my petsits to mix into my morning smoothie. Thanks for giving me some ideas! I would read a blog under the premise “100$ food budget weekly in NYC”. You definitely should consider publishing tips tricks and the beauty of living in the city! Hi Dana, I was curious as to whether you use canned coconut milk or the kind in the carton when you make your smoothies? Honestly, both work! But I like buying the canned because it is generally easier to find just coconut milk and water as the ingredients. Hope that helps! Ok so I made this for breakfast his morning and I am in love with this smoothie! I had a hard time with incorporating Spiralina in my diet and honestly couldn’t even find a “green” smoothie that I liked let alone adding the Spiralina. Thank you ONCE AGAIN for a fantastic recipe!! Yay! Thanks for sharing, Karen!! Ps, I bought a pack of spirulina for $4.99 at Tj Maxx! I’m glad you point out that it has a neutral taste when added to a smoothie I will have to try this when/if we ever get a blender. I tried mixing a “shot” of it with water, yick! I don’t recommend. That looks great. I am rather addicted to green smoothies. I make a similar one, but I usually just add water and ice to mine. Shared! Yum! I haven’t done spirulina in a while. May have to change that! This looks delicious! Oh wow! I love the color! It is so vibrant. Thank you for such a great recipe and amazing photos. I can’t wait to try it! Well…I’m a diehard seaweed fan, so. This. Is. just. omg!! @$%# !! Okay, so you say that you can purchase the Spirulina at Whole Foods market, but I am curious about how much you actually get for $13? I’ve bought matcha powder from Whole Foods in the past, and I was shocked at how expensive it was for just a tiny pot of the stuff ! It would be awesome if you could let me know how large the pot the Spirulina comes in. So odd! I’ve definitely never heard of that. I’ve heard of this before. Just read Amazon reviews and you’ll see this isn’t unheard of. I made this recipe this morning and have been violently ill all day. Sort of freaking out because my kids took a sip. Spirulina is a no-go for me. Definitely not this recipe or the fault of anyone but my own very sensitive tummy…but yikes. Proceed with caution when trying spirulina. Yes I have been feeling very sick since my shake this morning and it happened last time I made it so decided to look it up. Now I know the culprit! Will cut it out for now and maybe introduce in smaller amounts. I put a heaping teaspoon in my smoothie. Ugh don’t know what to do to feel better maybe some greasy tacos lol! I have heard of this. It’s could be your body’s way of detoxing, because spirulina is very detoxifying. I would start with a *very* small amount (1/4 teaspoon or less), and gradually increase as tolerated. Also make sure your spirulina is from a very pure source, stored properly and not expired. Sounds delicious and looks beautiful! How do you freeze fresh spinach or kale? Hi there! I buy it pre-washed and then throw the whole bag in the freezer. Or, I wash and dry, and then lay in a single layer and freeze, then store in a container or freezer bag. THE RECIPE SOUNDS GREAT HOWEVER I AM DISABLED AND UNABLE TO MAKE IT. CAN I BUY IT AND WHERE CAN I GET IT? Hi John! Unfortunately we don’t sell any of our recipes as products at this time, but thank you for reaching out! The color.. wow! Love using spirulina in my smoothies, it always gives it a little hint of mint. The color of this smoothie is just fantastic!! This almost makes me wanna get back into spirulina! It’s an investment, but a fun way to treat yo’self. Treat your body right! I drink it every day. I add paoaya,apples,bananas strawberries, blackberries. 2 tsp. And share it with my soon. I add water a d Almond milk. With a splash of coconut oil.